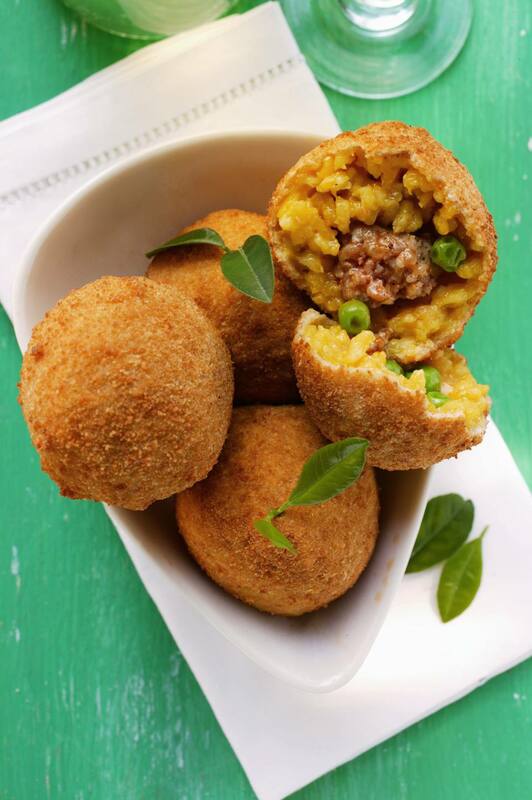 Arancini, rice balls stuffed with sauce and peas, are one of the best-loved Sicilian snacks and street foods, and they have become increasingly popular throughout Italy and worldwide. The filling in this recipe is one of the most classic -- a meat ragù, green peas, and melty mozzarella, but there are endless other types of fillings including pistachios, mushrooms, prosciutto and mozzarella, ham, spinach, and more. The rice is scented with saffron and the rice balls are rolled in breadcrumbs before frying them into croquettes. Usually, they're made with caciocavallo cheese, but since that can be difficult to find outside of Southern Italy, Parmigiano-Reggiano is used in this recipe. They can be eaten as an antipasto or snack, or even as a meal when coupled with perhaps a salad or soup. Note: while there are multiple steps to this recipe, Sicilian arancini is broken down into workable categories to help you better plan for preparation and cooking. In a large saucepan over medium-high heat, place the rice, saffron, and 1 1/2 cups water and bring to a boil. Cover, reduce heat to low, and let simmer about 15 to 20 minutes or until all of the water has been absorbed. Remove lid, stir in grated Parmigiano, butter, salt, and pepper, to taste. Spread the rice out on a large plate or baking dish to cool completely to room temperature. First, you'll start with a classic sofrito: Heat the olive oil in a small saucepan over medium-high heat. Add the onions, carrots, and celery and sauté, stirring often, until softened and the onions are translucent - about 8 to 10 minutes. Add the ground beef and pork and fry, stirring often, until browned - about 5 to 8 minutes. Add the wine and let cook until the alcohol aroma has reduced - about 1 minute. Stir in the tomato paste and tomato purée, reduce the heat to medium-low, and cook, stirring occasionally - about 10 minutes. Add the peas and continue to simmer the sauce for another 8 to 10 minutes, or until the peas are tender and the sauce is thickened. It should not be too liquidy. Transfer the filling to a bowl and set aside to let it cool. Once the rice and filling are completely cooled, start shaping your rice balls. Place 1 heaping tablespoon of rice in the palm of one hand, then use your fingers and thumb to shape it into a hollow bowl shape. Place about 1 teaspoon of the filling in the center and 1 to 2 small cubes of diced fresh mozzarella (if using). Then gently close the rice around the filling to form either a round ball shape or a cone/pear shape. When all of your arancini have been formed, whisk together the flour, eggs, 1/2 cup of water, and a pinch of salt in a shallow bowl until smooth. Spread the bread crumbs in a plate or baking dish. Gently roll each ball first in the egg-flour-water-salt mixture, letting any excess drip off. Then roll them in the breadcrumbs until evenly coated. At this point, you can refrigerate your arancini for 20 to 30 minutes to let them firm up if they seem a bit too loose or liquidy. If not, you can go directly to frying. Heat about 2 inches of neutral frying oil to 360F. Fry your arancini in batches of just 2 to 3 at a time, being careful not to overcrowd the pot until they are evenly golden-brown - about 3 minutes. Transfer them to a paper-towel-lined plate to drain. There is considerable debate among Sicilians themselves as to whether these golden fried rice balls should properly be called arancini (masculine) or arancine (feminine). In western Sicily, around Palermo and Agrigento, they're usually called arancine and have a round shape. There, it is argued, that since the name derives from the Italian word arancia (meaning "orange," as in the round fruit that these rice balls resemble in shape and color, arancine meaning "little oranges"), then technically arancine is more correct. In eastern Sicily, meanwhile, particularly around Messina and Catania, arancino is the term more commonly used, and the arancini have a more pear-shaped or conical form, rounder at the bottom and pointed at the top. There, the reasoning is that the term derives from the name of the fruit in Sicilian dialect -- arànciu. It's nearly impossible to say which is really correct since both arguments have some merit although, at this point, arancino has become the more widely diffused name, particularly in English-speaking countries.